Gor Mahia winger George ‘Blackberry’ Odhiambo cannot guarantee his future at the club with his contract running out at the end of the season. The resurgent Odhiambo has been a core figure in coach Dylan Kerr’s title winning squad and his exploits saw him named the Kenyan Premier League August Player of The Month. Kerr has categorically stated that he wants all his stars remaining at the club and Odhiambo’s future is already a concern for him. “What do you mean you are going to sign for a new club?” Kerr casually and jokingly asked Odhiambo after he completed an interview at the club’s training ground on Wednesday as he received his Player of the Month award. Odhiambo had insinuated that he might think of taking up a new challenge, citing three unnamed clubs which have approached him for his services. “At the moment, I am still a Gor Mahia player until December. There are three clubs which have approached me but at the moment I cannot say anything is conclusive. My agent is working on that and at the end of the season, I will make a decision,” the winger said. But Gor Mahia have already been boosted with another star whose contract runs out in December, striker Jacques Tuyisenge who has said he will be signing a new contract. He has also added he will convince his closest mates at the club, Karim Nizigiyimana and Godfrey Walusimbi to also append their signatures on new deals. On Wednesday evening, The club through their social media accounts announced that Musa Mohammed, Walusimbi and Harun Shakava had all added on two years to their current contracts, keeping them at the club until 2019. Odhiambo is another man coach Kerr will try convince to add another year on his contract as he looks forward to the CAF Champions League next year. The winger who returned to the club in 2014 after a four year absence scored twice and assisted thrice in August, finding favor in the Sports Journalists Association of Kenya (SJAK) football committee members who feted him. “I am really pleased to get this award though after working hard for most of the season, I knew something good will come. For the remaining four games of the season I will keep working and probably something good will come at the end of it,” Odhiambo said after being awarded. Odhiambo polled 18 points in the final vote conducted by the SJAK football committee, beating teammate Tuyisenge by a single point. Sofapaka goal poacher Umaru Kassumba managed 13 points to finish off third. 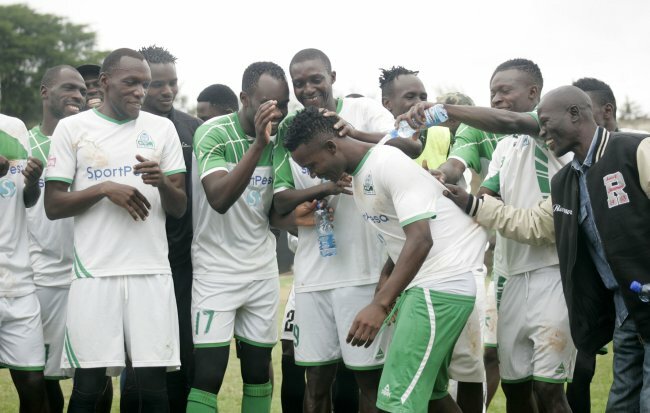 The three players made it to the final shortlist from a wider nominee’s list that also had SoNy Sugar’s pair of Amos Asembeka and Yemi Mwana as well as Mathare United’s Chrispin Oduor and K’Ogalo’s Godfrey Walusimbi. Odhiambo has had a bright season having tried for the last seven years to get back to his 2017 form. His hard work has seen him score five goals and provided six assists and in the process earning himself a place in the national team. “People were talking but I knew one day I would get back to the top. I have been patient, worked hard and now I have placed myself somewhere. It is not the end, I will keep on working,” the forward said. His form dipped after a famous move abroad went sour at the start of the 2011 season. Following his exploits in 2010 which earned him the Player of the Season award, Odhiambo moved to Denmark where he signed for top tier side Randers, but he could not cope up. He was later offloaded by the club and he joined Tanzanian side Azam where he couldn’t spend a considerable spell as well. Upon returning home in 2013, he was invited to Armenia for trials where he signed for top tier side FC Shirak before moving to Ullises, also in the Eastern European country. He ultimately ‘returned home’ in 2014.